So raise your hand if you did neon the first go round. I did. It was a fantastic sweatshirt in the brightest neon yellow and read "Totally Awesome!" I was of course one of the first at my school to have it...along with an arm full of rubber bracelets to match. I miss that shirt. Enter the neon trend and chance to revisit my stylish past. I recently bought a neon oversized sweater on clearance at the Gap (similar) that reminds me a lot of the sweatshirt-sans the 80s message. 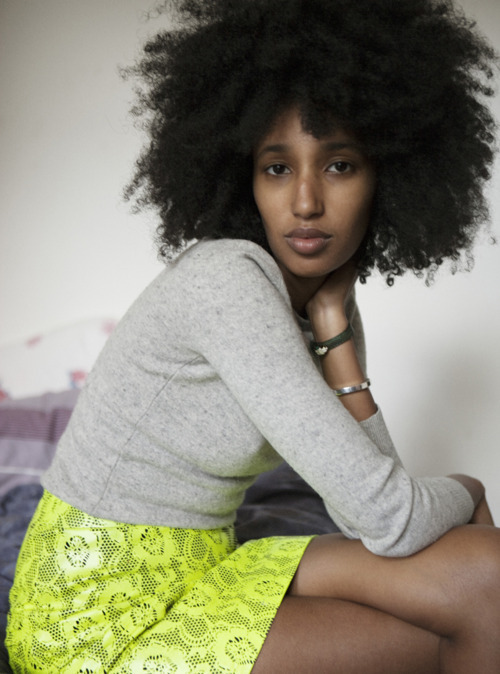 Picts later...but for now style crushin on Julia Sarr Jamois in a skirt of a similar color.